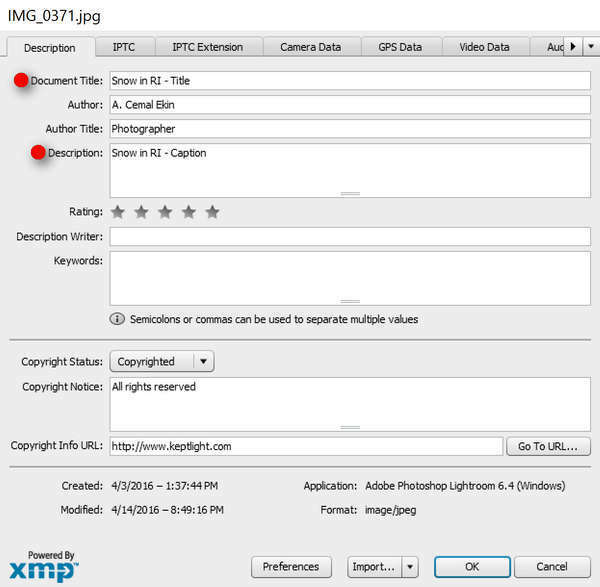 Embedded metadata in image files is not limited to EXIF recorded by the camera. You can, and more often than you think, you should embed simple information like your name, copyright notice, the title of the image and the caption. Depending on the operating system and the photo editing software you use there are simple ways of doing this. Before going any further, I should make it clear that I will mainly talk about what I know, Windows, Lightroom, Photoshop, although I am sure there are counterparts in Mac OS and Mac-specific software. You can and should do this every time you import new images. The process is easier if you first create a preset and then apply that preset to all your imports. 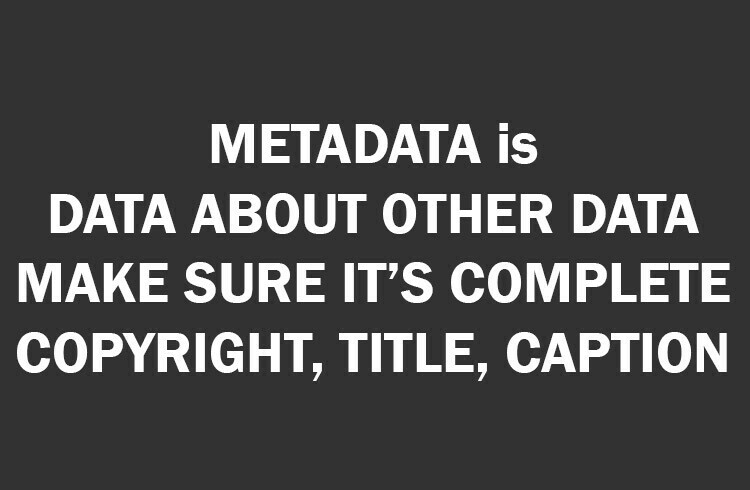 Take a look at the Metadata panel below. You will see my name, copyright notice, and the image is “Copyrighted.” Although I can enter this information one file at a time it will clearly be very tedious. Now, note the field next to the red dot at the top, “Preset.” You do this once, click on that drop-down, choose “Edit Presets,” and locate the fields shown in the Create/Edit Presets pop-up. After you fill in the field contents, substitute your information for those I have blurred, save this preset with a name. You can now select this metadata preset during your import to embed this information into every image Lightroom catalogs. This is the easy part, in the same metadata panel you see above, there are two fields, Title and Caption. Whatever you want them to be, simply enter them one field and one image at a time. Here is a parenthetical note for NextGEN Gallery users like me as a plugin for WordPress. When the images are uploaded NextGEN uses these fields into the same fields in the gallery. Depending on the image viewing plugin that may be in use and from which field it may read to display along with the image one of these fields will show up. To be on the safe side, I enter the same information into both fields, so no matter which one is picked it will display the correct title. If you edit your image in Photoshop, you can still enter the title and caption using the File Info panel. From the menu, select File/File Info, and you will see the multi-panel pop-up. If it is not showing, you may need to flip through the panels using the arrows at the top, including a drop-down selector. You want to see the panel “Description.” There you will see the fields to fill, Title and Description (Caption). In the image, they show the text I entered for this image in Lightroom. I included the field label in my text to show what they are. Enter the information you need, and while you are at it, you can also add the copyright information on this panel as well. 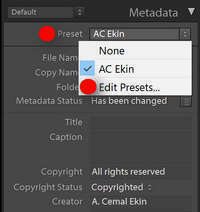 If you do not use Lightroom or Photoshop, your software may also allow entering various metadata including a title and a caption. But, there may be times when you may not have access to any of the tools, but the commonly available File Manager in Windows can do the same. Find the file you want to annotate, and right-click on the file name. From the pop-up menu, select “Properties” and click on “Details” to see the window below. There, you can enter the title and caption information as well as a copyright note and your name in the Author field. Adobe Photoshop Elements, EXIFTool and EXIFToolGUI, Breeze Browser, and quite possibly other image handling software are capable of adding the needed metadata to your files, especially those you show on the Internet and possibly those you may enter in competitions. 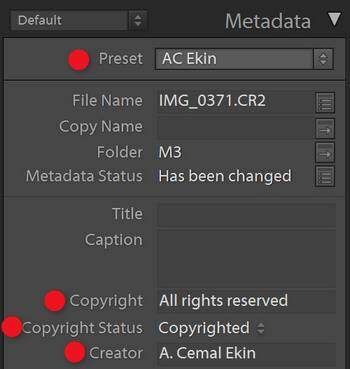 Adding copyright information to all your images is also an excellent idea. If it is there, nobody can claim ignorance. Although not all image handling software may support writing metadata, more of them, even Windows Explorer can read the copyright notice. 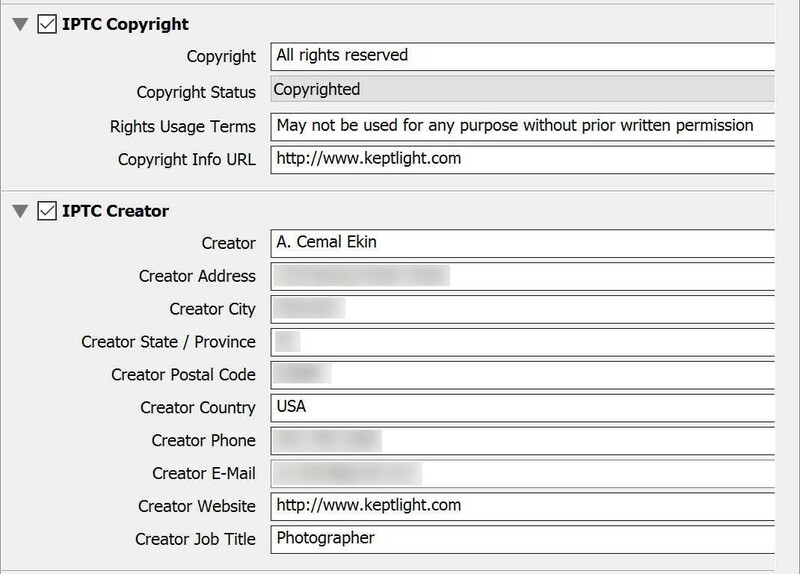 Your copyright information needs to contain the information that the image is copyrighted, and the kind of use, if any, may be allowed. My statement reads “May not be used for any purpose without prior written permission.” You also need to include some form of contact information for interested users to contact you. This is not the file name, so there should be no concern over periods being present in the title. Now, get going! Title those images, even if it is for titling sake. Who knows when that will be necessary. Thanks a lot, Cemal. Good information.